If you have write access to a repository, you can assign issues and pull requests to yourself, collaborators on personal projects, or members of your organization with read permissions on the repository. When creating assignments, you can add up to ten assignees to support your workflow. Select the checkbox next to the items you want to assign to someone. In the upper-right corner, click Assignee. To assign the items to a user, start typing their username, then click their name when it appears. You can select and add up to ten assignees to an issue or pull request. 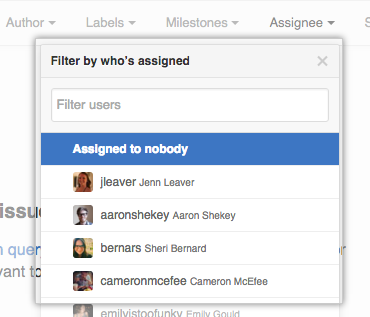 "Filtering issues and pull requests by assignees"